My favorite part of a chocolate-coated marshmallow candy is the texture â€“ that crisp, yet melty chocolate shell over a light, sweet, fluffy marshmallow filling. If the chocolateâ€™s a little on the dark side, so much the better. The chocolateâ€™s milk in this case, but it definitely delivered on the texture â€“ it has a nice snap, though itâ€™s a bit waxy in your mouth. The chocolate is just a very thin, crisp layer over a thick layer of marshmallow. The cynic in me wants to say thatâ€™s because chocolate is more expensive than a candy thatâ€™s mostly air â€“ but I canâ€™t complain since the marshmallow is really the main attraction here. The crisp chocolate, dense caramel and fluffy marshmallow combine for a treat thatâ€™s pretty substantial, despite its small size and low calorie count (only 10 calories more than the Marshmallow Egg). If you have to break your diet with Easter candy, you could do a lot worse. Overall, I found both eggs quite tasty, if nothing utterly spectacular. At the very least, theyâ€™re enough to put Russell Stover back on my list of candy companies to keep an eye on. The best Easter eggs are still the old Brachâ€™s cherry cream eggs. 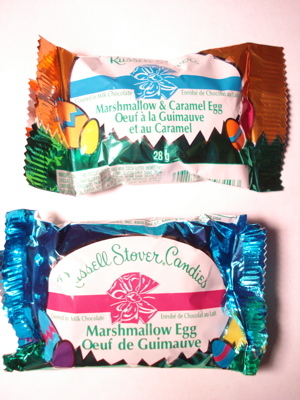 Russell Stover still makes one of the best Easter eggs.